From its rich, nutty flavor to its silky smooth texture, almond milk is easily one of our go-to kitchen staples. You’ve likely enjoyed this quintessential alt-milk in smoothies, caffeinated beverages and cereal, but you may not realize that there are even more delicious ways to use almond milk in your day to day cooking and baking. 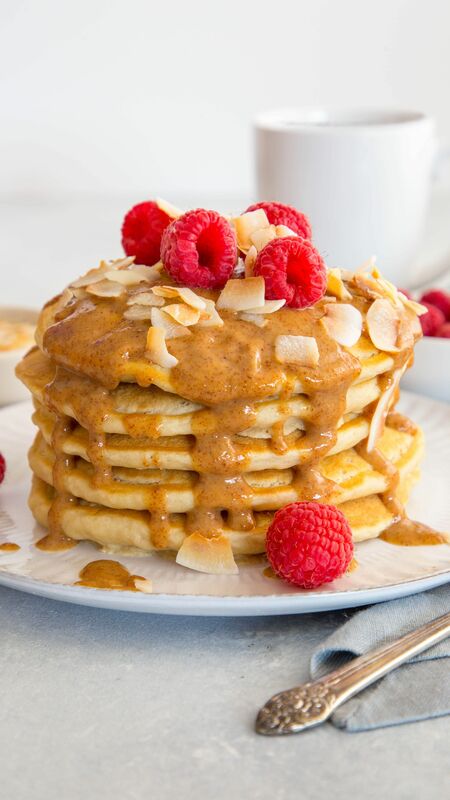 From pancakes to curry to cookies, we’re not being shy with our almond milk consumption, and we don’t think you should be, either! 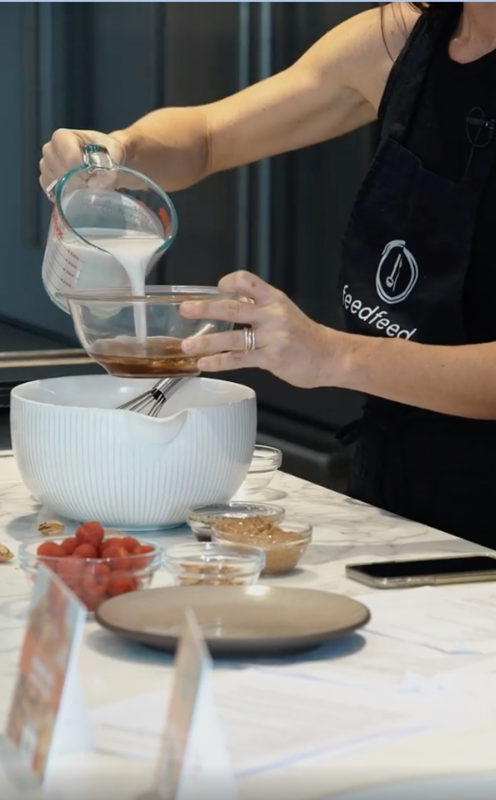 Get the recipe: Vanilla Almond Milk Pancakes with Almond Butter Drizzle; Watch us make them here! 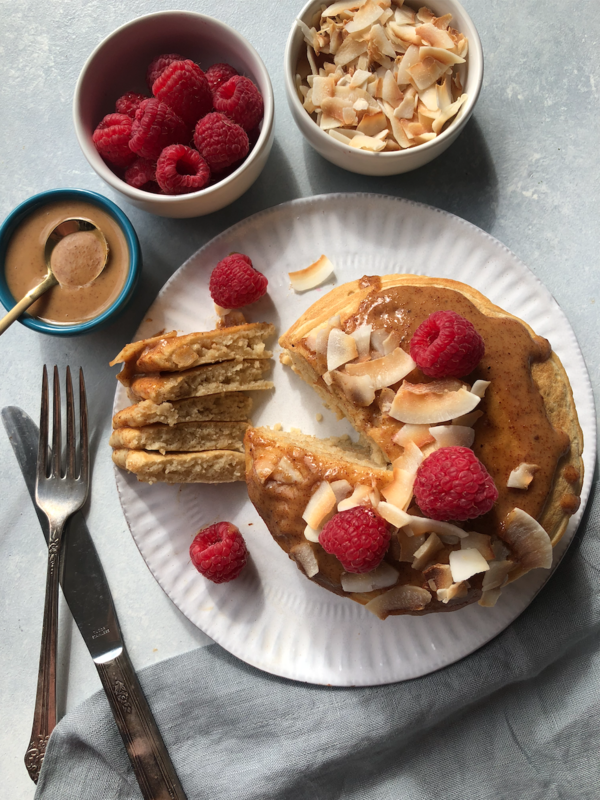 Your weekend breakfast just got a serious upgrade, and it comes in the form of these fluffy-as-ever pancakes with a simple almond butter drizzle, toasted coconut flakes, and fresh raspberries. Almond milk provides a slightly nutty flavor to these super simple flapjacks. Allowing the batter to rest for at least 10 minutes allows the gluten to relax while further hydrating the mixture, thus yielding a final product that is as light as cloud. And let’s be honest, who is going to turn down a warm, fluffy pancake? Chocolate lovers, this one's for you! These salty-sweet cookies use almonds four, yes FOUR ways. Almond flour, almond butter, toasted almonds, and almond milk join forces for a rich, satisfying treat that's perfect for a late night treat. They're gluten free, and if you want to make them vegan, feel free to substitute vegan butter and vegan chocolate. That's the beauty about baking with almond milk–the final product can always be made vegan! Get the recipe: Thai Sweet Potato-Parsnip Soup with Almond Milk, Ginger and Red Curry; Watch us make it here! Need a cozy, creamy soup to warm you up? This Thai Sweet Potato-Parsnip number will certainly do the trick! Almond milk provides a nutty flavor and silky texture to this ultra-smooth concoction. Topped with fresh cilantro, toasted almonds, and an extra drizzle of almond milk, this luscious sweet potato and parsnip soup is about to be the flavor explosion that will get you through the chilliest days of winter. 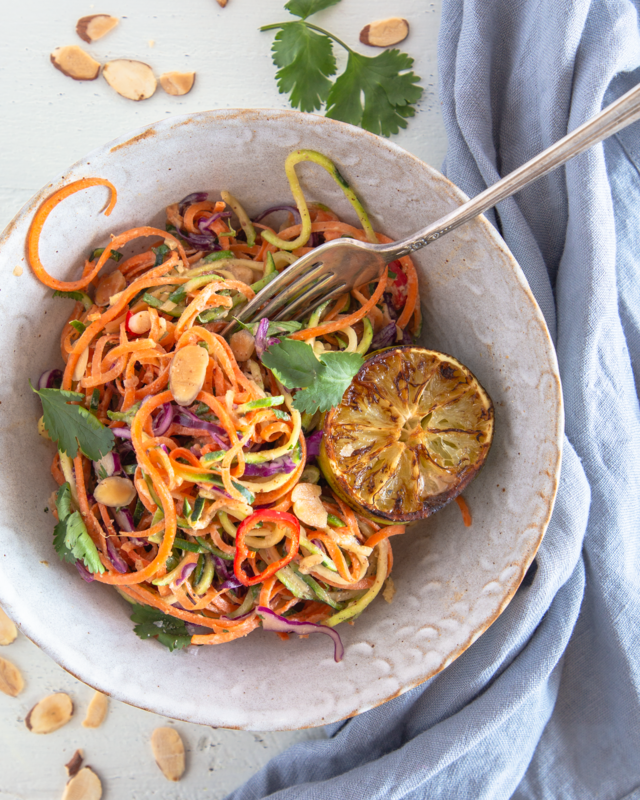 Get the recipe: Spicy Zucchini Noodles with Almond Milk and Almond Butter Dressing; Watch us make them here! Craving a hearty serving of veggies? This luscious bowl of zoodles is just as crunchy as it is delicious. Tossed in a zesty, spicy almond milk and almond butter dressing, this easy (and not to mention, vegan!) dinner is one that you’ll make time and time again. Freshly grated ginger and garlic bring a powerful punch to this dressing, while a drizzle of almond milk provides a silky smooth texture. Want to intensify the spice level? Toss in an extra pinch or two of red pepper flakes! Ready for a tasty weeknight dinner that comes together in under 30 minutes? Whip up these crispy chicken thighs! Pulsing a sofrito in the food processor saves you a ton of prep time while also creating a flavorful base for the rest of the dish. 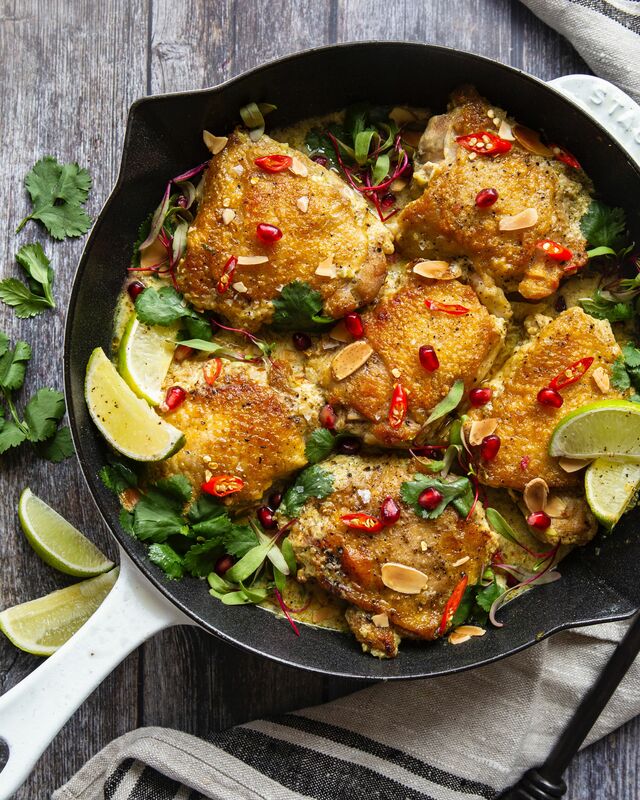 Creamy almond milk balances out the rich curry sauce for a chicken dinner that the whole family can enjoy. Don’t forget to garnish with extra limes and cilantro! I stopped by Meredith to meet with some of their editors and demo my favorite almond milk recipes. Check out the entire day here!